Baking bread, a cake, or cookies is one of life’s little pleasures. It gives you a quick sense of satisfaction and it provides you with some very tasty treats. Where do you begin though? We’ve got some great to get you started in the world of home baking. Building up your baking tool collection can take a long time. That’s why people have grandmas handing down old baking utensils after all. Obviously, we don’t cover every single eventuality here, but we do cover all the basics that mean you’re good to go with preparing a lot of great baking ideas. In each case, we’ve focused on the sweet spot between value and good quality. It’s a waste of money buying cheap quality utensils but you also don’t want to spend a fortune when you’re just starting out. All the products listed here will serve you well for a good long while, which will give you more than enough time to decide what tools are worth upgrading. So, whether you’ve been inspired by The Great British Bake Off, or you simply want to enjoy the satisfaction of baking your own delicious treats at home, here are our essential picks for baking. Oftentimes, baking sets are a waste of money. You end up with tools that you just don’t need. Amazon has done a great job of bundling together useful items in the form of its AmazonBasics 6-Piece Nonstick Bakeware Set. 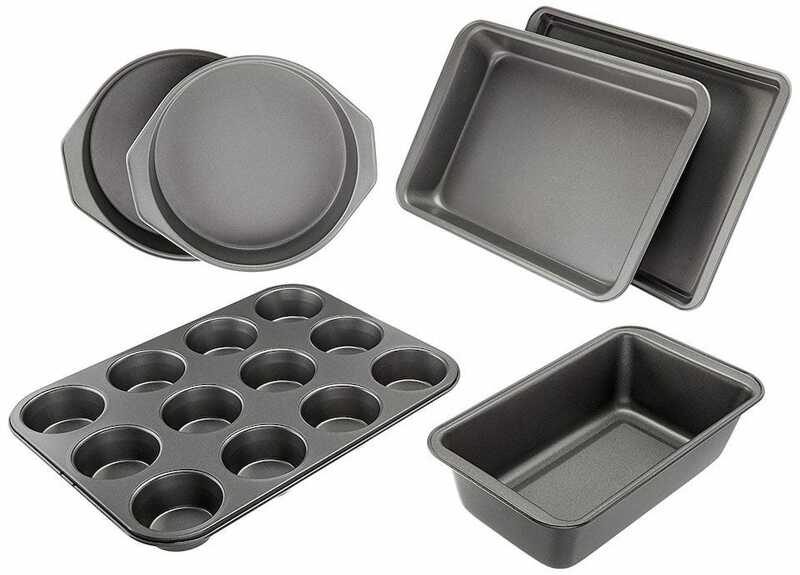 For a mere $20, you get one 9×5 inch loaf pan, 2 round 9-inch cake pans, a 12 cup muffin pan, a 13×9 inch roasting pan, and a 13×9 inch baking sheet. While the roasting pan isn’t really needed for baking (but will certainly come in handy elsewhere), the rest are perfect for when you start to bake cookies, muffins, or a cake. Each pan is made from heavy-weight carbon steel for even baking, and there’s a nonstick coating that stops batter from sticking. ‘But I only need one cooling rack!’ Nope, you’re wrong. You will end up baking more cookies, muffins or cake than you originally planned for. It’s just how it ends up when you bake tasty treats. 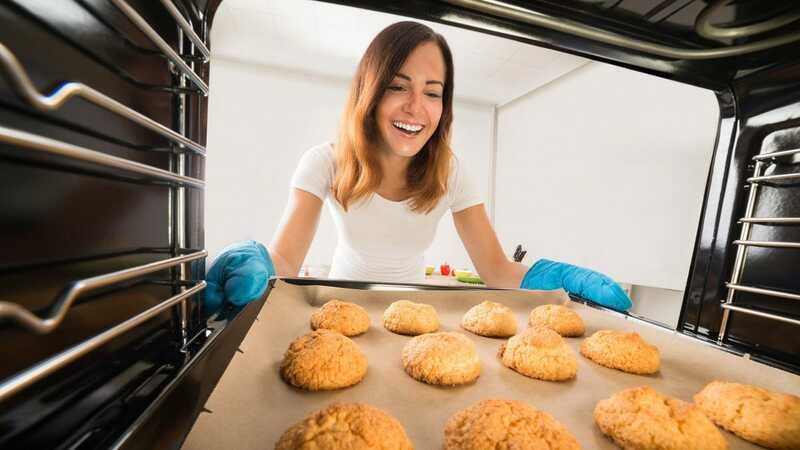 It’s only natural that you end up baking more than you ‘need’ so buy the Tebery 4 Pack Cooling Racks Baking Rack – 16″ x 10″, and you’re good to go for plenty more cookies than anticipated. It has 4 stable feet to keep the items raised above the counter safely, plus there’s a nonstick coating so nothing is going to stick along the way. One of the less exciting parts of cooking or baking is measuring ingredients. In the case of baking, it’s often very important to get the measurements just right. Buy the New Star Foodservice 42917 Stainless Steel 4Pcs Measuring Cups And Spoons Combo Set, Silver and this is going to be a breeze. 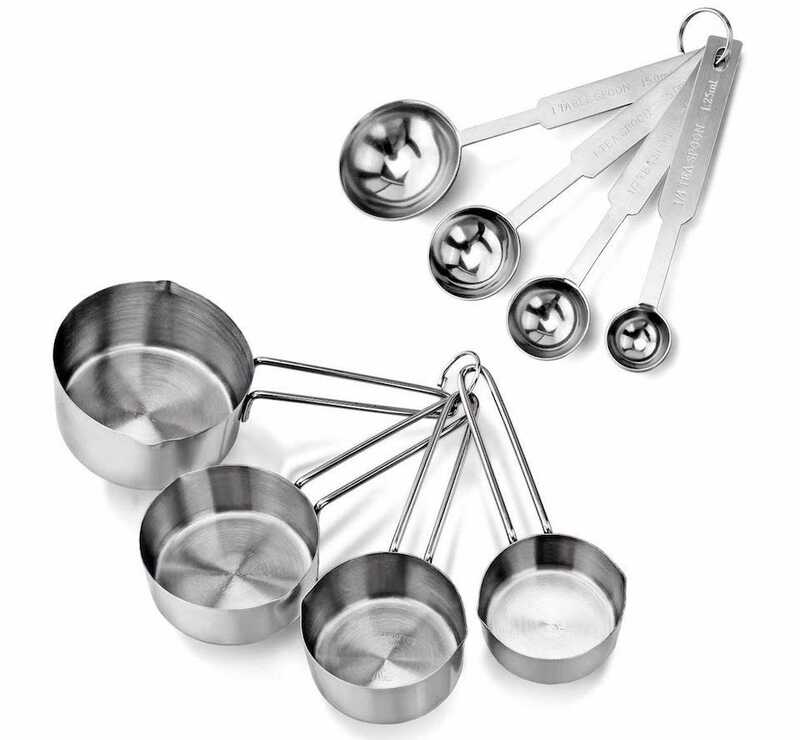 The set includes a mixture of measuring cups and measuring spoons, encompassing all the sizes you could possibly need from 1 cup to 1/4 cup, right down to a tablespoon or 1/4 of a teaspoon. The set looks quite smart and cleans up easily too. Once you’ve prepared ingredients, you need to be able to mix them up in a bowl. 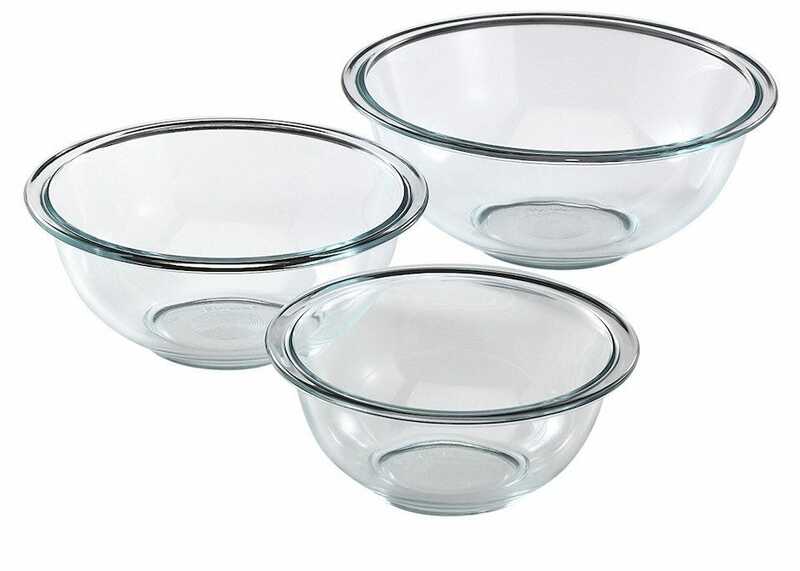 Pyrex’s Glass Mixing Bowl Set is an ideal place to start. You use the biggest one to mix together all the ingredients, while the smaller ones can be used to set aside flour or other ingredients that need adding later. The bowl is suitably weighty, made from non-porous glass so it doesn’t stain, and it’s safe in a microwave, dishwasher, preheated oven or freezer. One of the most enjoyable (but trickier) parts of cake baking is the decorations you apply afterwards. Frosting a cake makes a simple sponge look fantastic so you need an effective icing spatula to do this. The Wilton Icing Spatula is that spatula. 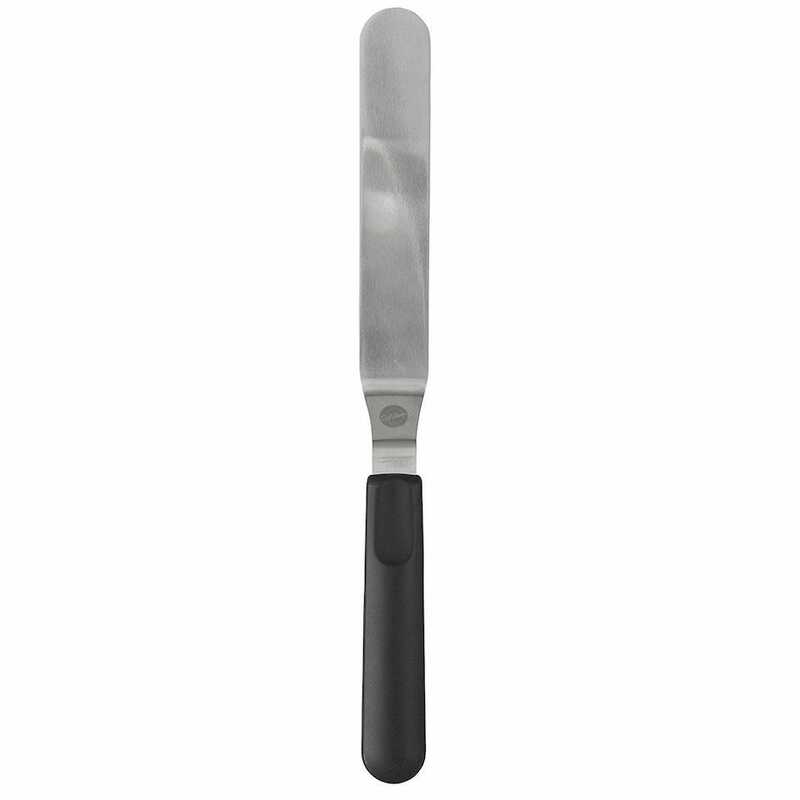 It’s angled so it’s easy to use with frosting or for smoothing icing on a cake without making weird marks, like you can with a regular knife. It’s 13 inches long so covers a wide area, plus its handle is ergonomically designed so it’s comfortable to use. For those times you wish to apply a glaze rather than frosting (like when baking pastries), a good set of pastry brushes is essential. 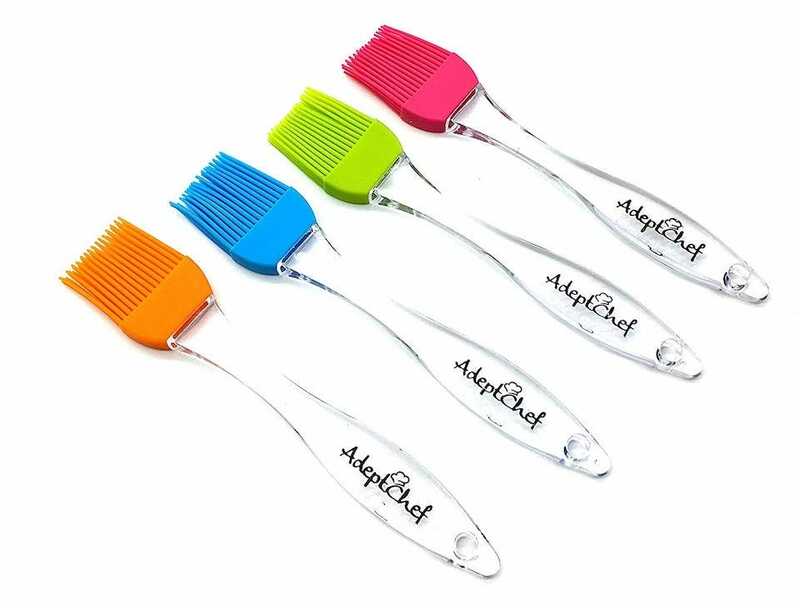 The AdeptChef Professional Silicone Basting & Pastry Brushes are pretty great. 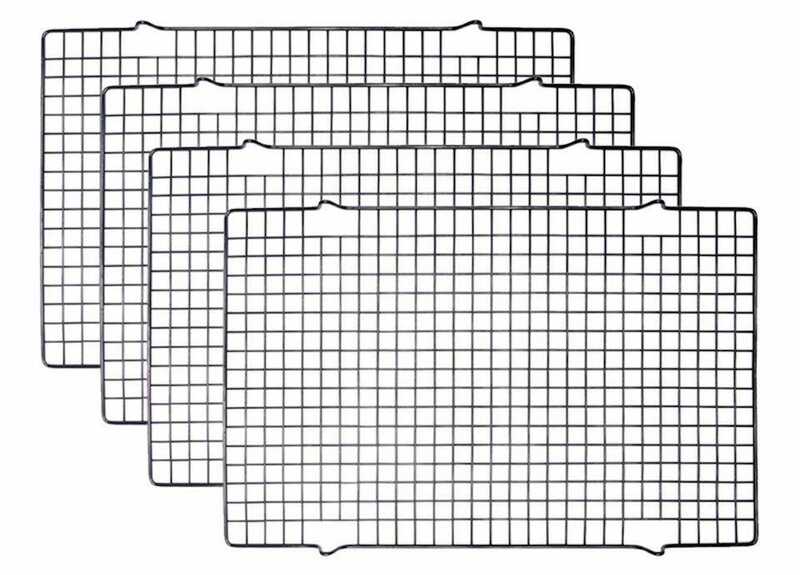 Well priced, they come in four different colors so you can remember to use different ones for different tasks. Made from tough FDA approved silicone, the material doesn’t melt, discolor or shrink, and it washes easily too. Simply dip into whatever glaze you want to apply, and brush away. A tasty glaze can make a big difference. Sometimes, you need to be able to sieve flour or icing sugar so that it’s suitably prepared before you bake with it. 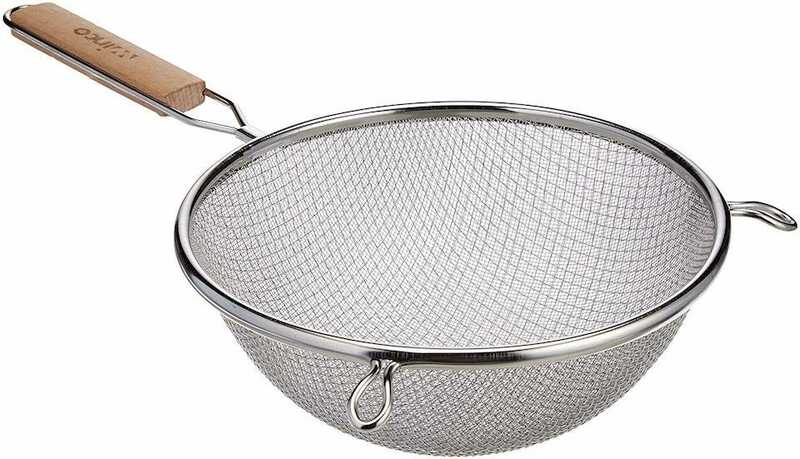 It’s a dull job but you need a strainer either way. We’ve recommended the Winco Strainer before because it simply does the job well. It isn’t stylish or particularly exciting, but made from a mixture of a wooden handle and easy to clean stainless steel, it’s hard to fault. We’ll let you into a lazy secret—you can use a wine bottle or a beer bottle as a rolling pin. It’s a convenient little MacGyver hack, but really, you want to buy a real one. It’s far more hygienic to have your own dedicated rolling pin. The Good Cook Classic Wood Rolling Pin is only $5 so there’s no excuse not to. It’s suitably heavy, made from genuine hardwood, so it’s good for knocking some shape into dough or flattening out some pastry. Rolling out stuff is one of the more cathartic parts of baking too, which makes it all the better to use a proper tool and really enjoy the experience. Remember what we said about the importance of accurately measured ingredients? 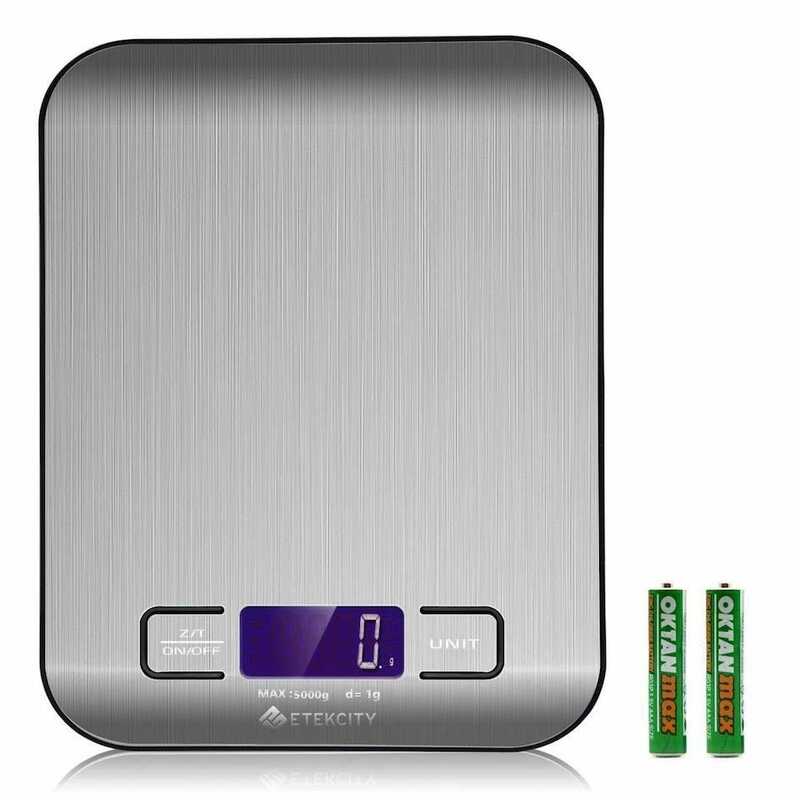 Buy the Etekcity Digital Kitchen Scale for when you need to measure more than just a cup’s worth of ingredients. It’s inexpensive yet accurate. You can set it so that the current weight resets to zero, even if you place a bowl on top of it, with a choice of measurements too. Quick unit conversion ensures you won’t be baffled at any point, or required to do any math in your head. It’s small and lightweight too, so easy to store in your kitchen. Many baking recipes involve whisking up ingredients, whether it’s whisking cream to make it thicker or simply mixing together flour, eggs, and sugar. The Silicone Whisk Set of 3 is cheap, cheerful, and fun. 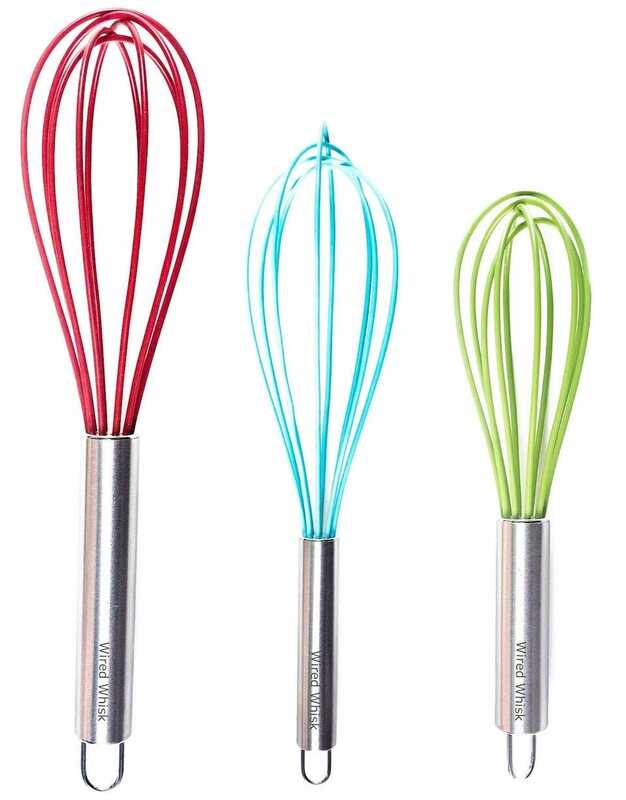 Each whisk is a slightly different size, so they’re ideal for different scenarios and mixing bowls. Made from silicone, they won’t damage your pots or pans, plus they’re resistant to high temperatures while cooking. Each whisk is really easy to clean afterward too, so it’s a firm favorite in anyone’s kitchen. I used to be prone to placing too much cookie dough on a baking tray, and creating huge cookies. That wasn’t strictly a bad thing by any means, but it didn’t look as neat as if I had a specific shape to stick to. Then I bought the Magicyoyo Cookie Scoops Set of 3 and now I have uniform size cookies, which go a lot further. 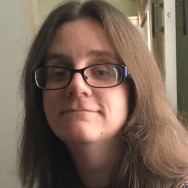 The choice of sizes means you can still make some fairly big cookies, or some fairly small (almost bite sized) ones—but whatever you pick your cookies will be consistently big or small. 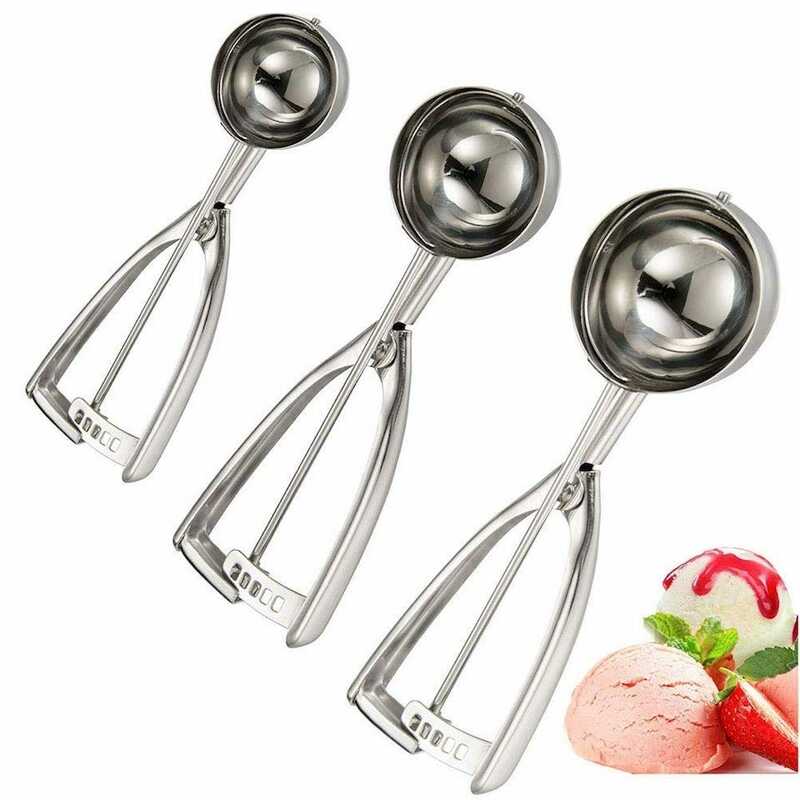 The scoops also double up as ice cream scoops or melon ballers, which is sure to come in handy at some point. They’re really easy to clean too. Advent calendars have come a long way since the little milk chocolate filled ones you may have gotten from doting grandmothers in your youth. Our selection of fun advent calendars covers everything from LEGO to whiskey.